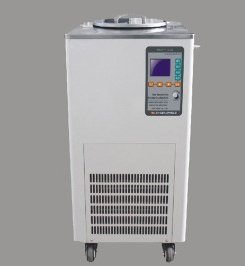 The use of cryogenic temperature stirring bath The DHJF series of low temperature thermostatic stirring bath produced by Zhengzhou Great Wall Technology & Trade Co., Ltd. can replace dry ice and liquid nitrogen for low temperature reaction, and can be used as a cryogenic temperature bath for viscosity measurement. Through the integrated design of the sensor and the circulation pump flow, the temperature control accuracy and temperature field uniformity are greatly improved, the temperature in the tank is more uniform, and the use of a low temperature and constant temperature circulation pump can be independently performed and a constant temperature cold source can be provided; the temperature programming and 5-step program control function, not only suitable for single point thermostatic control, but also suitable for continuous variable temperature control, can set 5 different temperature periods to meet the requirements of different temperature tests; can also be equipped with built-in two-stage stirring, and the reaction vessel Stir the sample together to keep the temperature of the sample uniform. The key components such as the compressor of the refrigeration system adopt imported brand-name products to ensure the safe and efficient operation of the system; the system is equipped with a water-cooled condenser. The scope of application of low temperature constant temperature stirring bath The equipment is mainly suitable for cooling, heating, constant temperature and other applications in flasks, beakers, test tubes, etc. The experiments, testing and identification in hospitals, scientific research, and universities in the field of biological enzymes are widely used, following Examples of applications: 1. Provide magnetic stirring and constant temperature test sites and field sources for glass vessels and glass reactors; 2. Provide cryogenic cooling circulating fluid for rotovap condensers or oil bath coils; 3. Laminated glass ã€Stainless steel reactor provides ultra-high temperature and low temperature constant temperature circulating fluid; 4ã€Provides thermostatic experimental field source for petroleum, materials, biology, medicine, food industry applications; 5ã€Low temperature cooling and temperature control of power supply and light source part of electron microscope; 6 , Low-temperature cooling and temperature control of the heating parts of industrial machinery; 7, low temperature cooling and temperature control of electrophoresis apparatus, viscometer, medical cold cap, cooling blanket; 8, electron microscope, molecular pump, ion pump, diffusion Pumps, microwave therapy machines for cryogenic cooling and temperature control and more. 1, the range of temperature and humidity. 2. After the liquid tank is filled with liquid, it is forbidden to carry the instrument or tilt the instrument at will, so as to prevent the working medium from intruding into the mechanism and causing danger or damage to the machine. 3. There should be enough space around the vent hole on the instrument and good dust protection. Keep the instrument away from the heating equipment and avoid direct sunlight. 4. The instrument should not be used in places that are flammable, explosive and have serious environmental corrosion.